In today’s competitive environment, it is not uncommon to find lawyers taking on more cases than they can handle in order to be make up for the competitive rates they offer in terms of the hourly that they charge. As a result, the client may suffer in the long run even though they think they may have obtained a bargain on the hourly rate. The concern is the lawyers may not spend sufficient time in evaluating the strengths and weaknesses of the case to devise a workable litigation strategy which will achieve the client’s objectives in the most cost effective manner. The litigation strategy should be devised at a very early stage, prior to commencing legal suit. With the initial litigation strategy and case map, the client can then make a decision whether launching the legal case would serve their business and financial purpose, bearing in mind of the legal costs which they will incur. After deciding to commence legal proceedings, the client should demand for constant evaluation and update of the litigation strategy adopted in order to reflect the factual development of the case. 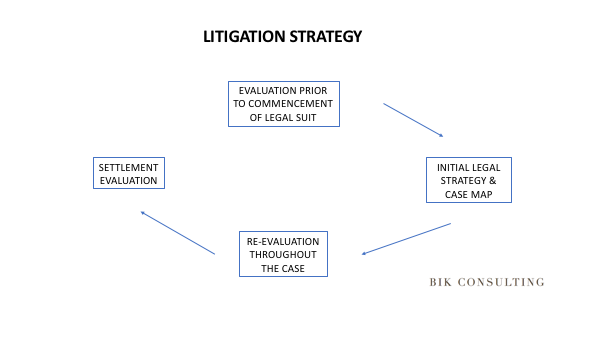 Exploration of fresh litigation strategies is a continuous process which should be conducted all the way up to the conclusion of trial to assist the client to make cost benefits decision in respect of various litigation strategies under consideration. The case map and litigation strategy plan will indeed be very helpful when it comes to evaluating whether to accept a proposal for settlement. The client would be able assess whether the cost of giving up the chance of receiving the full amount claimed is justified by the time and costs saved by not going through a full trial. There is always some risks involved to go through a full trial even though the client has a very good claim. You may use the Court Case Prediction Tool to assist you in predicting the outcome of a court case. It is a free tool and you may use it as many times as you like.